The Tuininga Family Adventures: 5 Year Ugandaversary! It's hard to believe but today officially marks 5 years for us in Uganda! We are so thankful for this time! Sometimes, it is hard to believe we've survived this long (haha!) Most of the time it feels as if the time has just flown by! 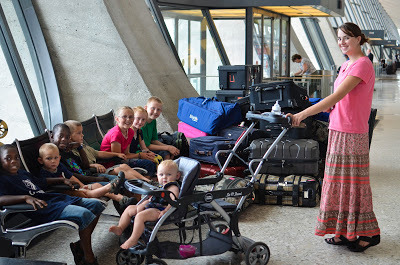 The kids were SO little and waited so patiently as we checked in! But this is for sure: God has been faithful to strengthen us when we needed strengthening, comfort us when we needed comforting, rebuke us when we needed rebuking, give us a break when we needed a break, help us to press on when we needed to dig in and press on; He has kept us, loved us, filled us, blessed us. There has been no step taken on this red dirt where he has not walked before us, beside us and behind us. So here is an Ebeneezer: thus far has God brought us! May His name be glorified and praised for who He is and all that He has done!